Regular readers of these Bionicle reviews will know that I dig the Ice Guy more than all the rest. But since Shocka already beat me to a review of Kurahk, I had to go to my next favorite, the Water Chick. Guurahk's staff emits a powerful cone of energy which can disintegrate whatever it strikes: a web of cracks appears in his target, and eventually it collapses to the ground. But the staff would mean nothing without Guurahk's skill at divining an opponent¹s weak spot - he is able to spot the stress point in any structure or the weakness in any foe and target it immediately. Huh, okay. For the first time, it seems that the blue Bionicle in the line isn't a female. Of course, no genders were ever specified for the Bohrok, either, so who knows? Like those previous baddies, all the Rahkshi share the same basic body construction: vaguely insectoid, Guurahk is an elongated nightmare. 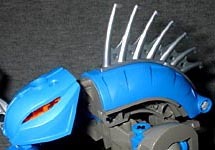 The carapace on his back is adorned with aquatic fins, and the standard Rahkshi head, cast in blue plastic, looks rather like an eel or other deadly creature. Turn the peg protruding from Guurahk's back, and he twists at the waist to strike at any foes nearby. The prongs of his staff look somewhat like fins or oars, which suits blue's legacy as an inhabitant of the oceans and rivers. 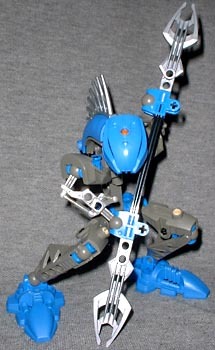 Guurahk's legs are built from several pieces, which not only pushes him toward the 9" mark, but also gives him more lower-half mobility than the previous Bionicles: you can pose Guurahk in a sinster crouch, bowing before Makuta, or lunging forth to strike at his enemies. His massive feet provide a supremely stable base for the ball-jointed knees and ankles to work above. Guurahk's Kraata-Ul is molded in a two-tone blue, dark in the front and light in the back. Strike down on Guurahk's head, and the figure ejects its kraata at whomever is standing before it. It's a fun little action feature, inspired by the Bohrok, that is powered entirely by gravity, but still adds a lot to the toy and the storyline. Lego is continuing the Bionicle tradition of fun toys and an engaging story. The heroes have a new threat to face, and new adventures on the horizon.